Housekeeping may call to mind scrubbing, cleaning, and picking up. But in a workplace setting, “housekeeping” is synonymous with safety! Let’s review the basic musts of workplace housekeeping. 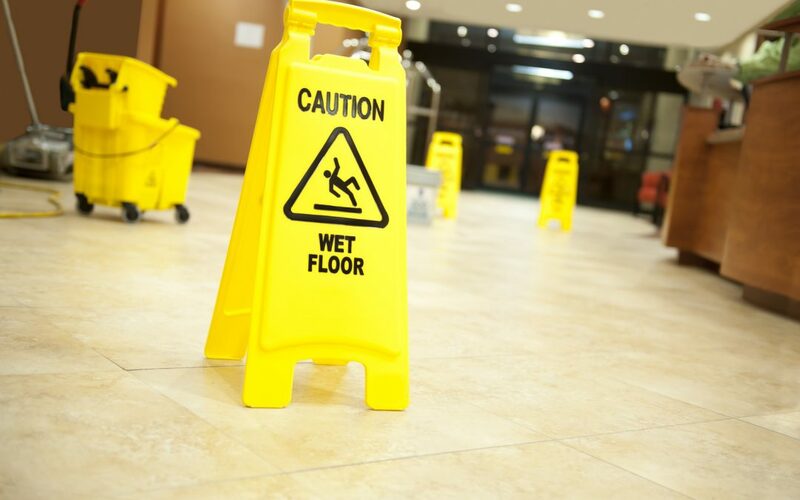 Accidents that would be categorized under the heading of “Slips, Trips, and Falls” are almost always the leading cause of injury in the workplace, year after year. After all, virtually everyone, no matter what their job or where they work, is susceptible to slipping, tripping, or falling. OSHA states that workplaces need to be “kept clean and orderly and in sanitary condition.” Substances like oil, grease, and water must be cleaning up immediately. Aisles and walkways need to be clear of debris. Mirrors and warning signs should be installed in “blind spot areas.” Damaged flooring should be replaced. Anti-slip flooring or mats should be used in areas that cannot always be kept clean. OSHA states that combustible waste should be stored in covered metal receptacles and disposed of daily.” Keep combustible materials in the work area only in necessary amounts. Store quick-burning, flammable materials in designated locates, away from ignition sources. Avoid contaminating clothes with flammable liquids. Keep materials 18 inches away from fire extinguishers, sprinklers, and sprinkler controls. Dust accumulation of more than 1/32 of an inch, covering at least 5% of a room’s surface poses a significant explosion hazard, according to the National Fire Protection Association. NFPA 654 – fire and dust explosion standard – addresses identifying hazard areas, controlling dust and housekeeping. The standard states that the preferred method is vacuuming. Ideally make use of a wet-vacuuming system. Floor mats should be kept clean, to help stop the spread of hazardous materials to other areas of the workplace, or to the homes of workers. Workers who deal with toxic materials should never wear the work attire home. Toe boards, toe rails and nets can prevent falling objects from hitting workers. Place heavy objects on lower shelves. Don’t stack items near walking areas. Return tools and other materials to storage immediately after use. Keep aisles, stariways, emergency exits, electrical panels, and doors free of clutter. OSHA’S Materials Handling, Storage, Use and Disposal Standard (1926.250) states that storage areas should not have an accumulation of materials that present hazards for tripping, fire, explosion, or pests. Don’t store items such as ladders, tools, in electrical closets, where important electrical panels could be blocked. Always wear all required P.P.E. Inspect all P.P.E. before using it, discard or have serviced as necessary. Don’t use damaged tools. If you have questions regarding P.P.E., or what P.P.E. is needed, ask a supervisor or safety. Decide what role each employee in each department in the workplace will play in daily housekeeping. What times during the day should be reserved specifically for clean up? While housekeeping is an ongoing task, it may be ideal to carve out time at the end of a shift specifically for clean-up. Everyone should have a hand in housekeeping, and should know what areas they need to maintain.